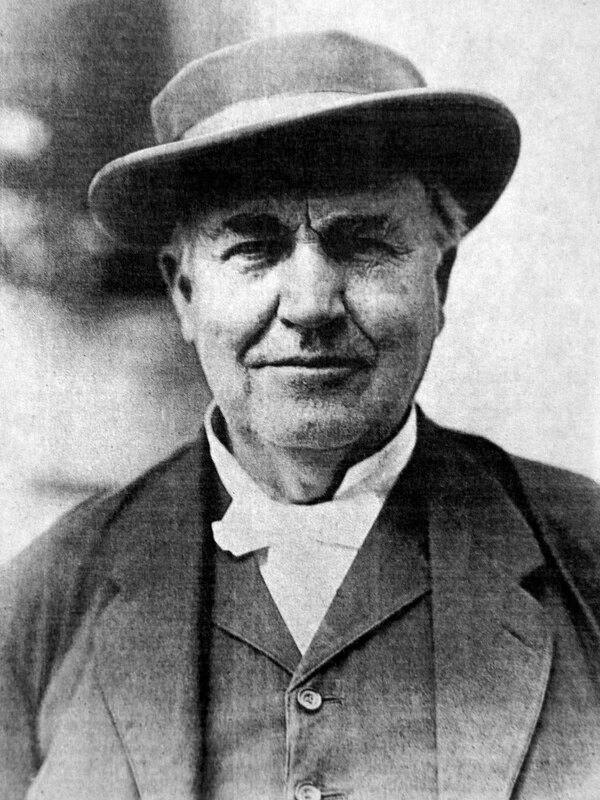 Thomas Alva Edison was born in Milan, Ohio, on February 11, 1847. His mother Nancy was a school teacher, and his father Samuel was a shopkeeper. As a child Thomas attended public school for 12 weeks until his teacher complained that he was always distracted. As a result he was home-schooled by his mother. At the age of 12 he began selling newspapers, candy, and sandwiches at a local train station. Then when Thomas was 15 years old he miraculously saved a little boy from being run over by a rail car. As a result, the boys father, who was a telegrapher, taught young Thomas how to telegraph. Young Edison worked for the next 6 years in towns all over the Midwest. During this time, he became interested in making telegraphy work easier and faster. In 1866, at the age of 19, Edison went to work for the Associated Press. At the same time he also began reading about British scientist Michael Faraday and his work with electricity and magnetism. In 1869, Edison moved to Boston to work as a full time inventor. Edison received his first patent on a voting machine, but he did not make any money on the invention because the politicians were not interested in quick results. Just a short time later, he developed the Universal Stock Ticker tape machine which synchronized several transactions at once. In 1869, the Gold and Stock Reporting Telegraph Company paid him $40,000 for the rights to his invention. At the time he was only 22 years of age. Before long, he and William Unger opened up the Newark Telegraph Works. Then in 1870, Edison developed the quadraplex telegraph system that was capable of transmitted two signals in two different directions at once. It was purchased by Jay Gould for $100,000. In 1876, Thomas Edison moved his laboratory to Menlo Park. In Menlo Park Edison hired only the most talented individuals. Many of these individuals were immigrants who were assigned a specific responsibility. The top two researchers at his Menlo Park facility were Charles Batchelor and John Kruesi. Throughout the next 6 years they assisted Edison on numerous inventions including the electric light bulb, phonograph, alkaline battery, and electric generator. Edison applied for the telephone patent at the same time as Alexander Graham Bell, and Elisha Gray. However, because Bell was the first to demonstrate its use he won the patent. Not long afterward Bell's phone would include an Edison invented carbon-button transmitting device. Batchelor and Kruesi also worked with Edison on the strengthening of telephone signals, which in 1877 led them to the discovery of recorded sound. Then a short time later, the invention of the cylinder phonograph earned Edison the title of the Wizard of Menlo Park. Edison's greatest invention was incandescent lighting. Arch lighting had already been implemented, but was impractical for lighting homes and shops. Edison developed an entire electrical system. He invented the distribution system, generator, and light bulb. His researchers developed the light bulb in 1879. This was followed by the Edison/Francis Upton generator that produced direct current. The following year Edison was joined by J.P. Morgan and other investors who formed the Edison Electric Illuminating Company. In 1881, they laid underground cables throughout New York City for electrical distribution. At the same time they constructed the first electrical generating station. In all, Edison held over 1,000 patents. He devoted the last years of his life attempting to develop a synthetic substitute for rubber.